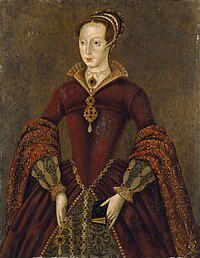 Lady Jane Grey (1536/1537 – 12 February 1554) became Queen of England in 1553 after the death of Protestant king, Edward VI of England. She was Protestant, and was a first cousin once removed of Edward. Edward VI chose her to succeed him to the throne of England instead of his half-sister Mary, a Roman Catholic. He feared Mary would overturn his reforms to the Church of England and return the kingdom to Catholicism. The Privy Council overturned Edward's will. Grey was arrested for treason after nine days as queen. Her young husband was also arrested and then beheaded on Tower Hill. Grey was beheaded on Tower Green inside the walls of the Tower of London. Both were buried in St. Peter ad Vinicula, a church inside the Tower. Grey was popularly known as the "nine days Queen".